What is a Hybrid Solar Cell or a Dye Solar Cell anyway? Before taking a dive into the details, we would like to encourage our readers who aren't familiar with these solar cell technologies to visit the Solar Cell pages first. 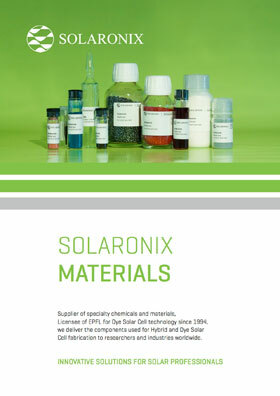 Below is an introduction about how to make Hybrid and Dye Solar Cells and how to start using the chemicals and components offered by Solaronix. The scientific literature reports many different approaches to making Hybrid or Dye Solar Cells. The simplest and most common design is a glass/glass assembly in which the two electrodes are fabricated from coated glass substrates. Further reading will reveal more sophisticated designs such as the monolithic and solid-state assemblies, which differ by the types of electrodes employed. Both anode and cathode are assembled on glass substrates. A liquid electrolyte fills up the space left between the electrodes after sealing. TCO22-7 - 2.2 mm sodalime glass coated with a 7 ohm/square fluorine-doped tin oxide (FTO) layer. Ti-Nanoxide D - a versatile formulation of titanium dioxide nanoparticles and diffusing particles which can be easily applied by slot-coating (or doctor-blade). Ti-Nanoxide D/SP is specifically suited for customers using screen-printing as the deposition technique. Ruthenizer 535-bisTBA - one of the best sensitizing dyes, regarded as the industry standard. Iodolyte HI-30 - the reference electrolyte for test cells. Alternatively, Mosalyte TDE-250, a solvent-free electrolyte for durability and long lifetime. Meltonix 1170-60PF - a 60 micron thick hot-melt film featuring a protection layer for easy manipulation. Platisol T - platinum precursor paint. Platisol T/SP is an alternative that is suitable for screen-printing. The cathode used in monolithic cells is typically a conductive carbon layer that is deposited on an insulating layer to avoid direct contact with the titania anode. The whole stack is porous and hosts the electrolyte. 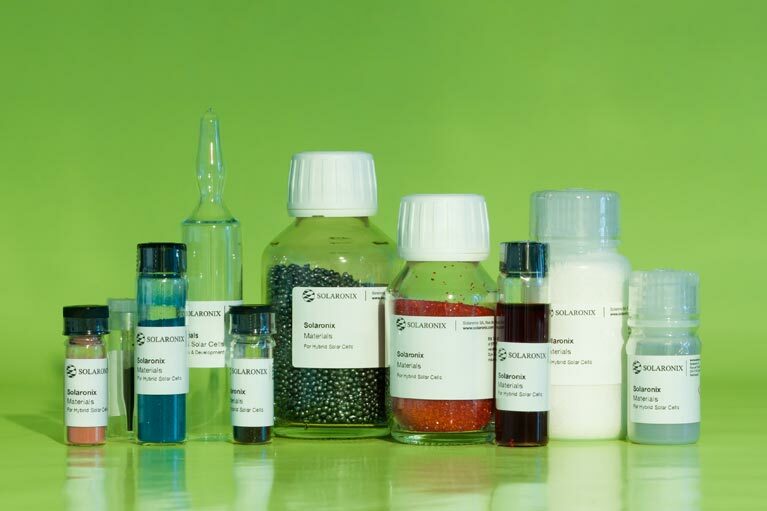 Nanoxide T/SP - a screen-printable paste of titanium dioxide nanoparticles. Zr-Nanoxide - a screen printable zirconium oxide paste for insulating layers. Elcocarb C/SP - exclusive carbon paste for the preparation of Dye Solar Cell counter-electrodes. The liquid electrolyte is entirely replaced by a solid hole transport material which forms a counter-electrode together with a metallic back contact. TCO22-7 - 2.2 mm sodalime glass coated with a 7 ohm/sq. fluorine-doped tin oxide (FTO) layer. Ti-Nanoxide BL/SP - a screen-printable paste for the deposition of a compact layer of titanium dioxide. Ti-Nanoxide T/SP - a screen-printable paste of titanium dioxide nanoparticles. Sensidizer BA504 or Sensidizer BA741 - photosensitizing dyes specially suited for solid-state solar cells. How do I make Dye Solar Cells? Solaronix provides a free tutorial to help you get started. 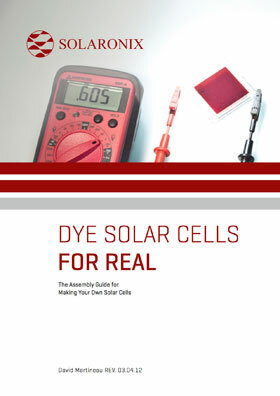 This tutorial was inspired by requests from Dye Solar Cell enthusiasts looking for a place to start. Some of them were scientists starting to investigate the technology, while others were professors who wanted to teach the assembly in training courses. Whether this is your situation or not, we hope you will find this tutorial useful, helping you to successfully make your own Dye Solar Cells! Thanks to our our Application Notes, customers can benefit from all of our advices, tips, and tricks for free. The Application Notes contain detailed instructions compiled from the most frequently asked questions and examples of what can be achieved. They allow for comparison with your own experiments and help to get better results faster by avoiding the most common mis-steps.